Making a window treatment does not have to be complicated or expensive. 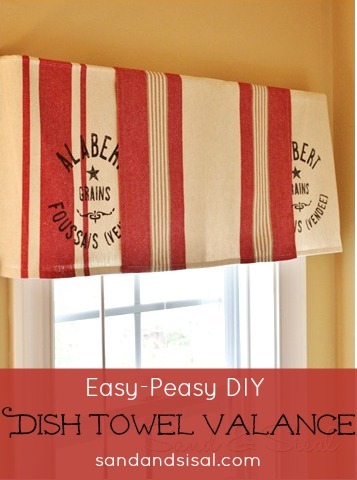 Making a dish towel valance is about as simple as it gets! Yes, I said dish towels. This season the stores are loaded with beautiful printed towels. Target has gorgeous grain sack printed towels in a cotton/linen blend, so why not create something beautiful like a valance out of them! These are the grain sack towels from Target. Next I removed the old floral valance that hung in my downstairs bathroom. I was never really fond of that print. We were already updating the board and batten in that bathroom (read about it HERE), so a new valance was a good idea too! I gave each towel a good press with an iron to get out all wrinkles and simply folded each towel over the bar. This is a picture of the bathroom before. And here it is now AFTER, all updated with trimmed out board and batten and a grain sack dish towel valance. See The Lettered Cottage’s gorgeous photo peeking in the mirror? I’m loving how it all comes together now. So tell me what you think! Tell me about your simple valance projects you’ve done! I’d love to hear from you! Very nice! They are really hanging well. I thought for sure you stitched them together or you were using a 2nd rod at the bottom. I think I need to make a trip to Target now. Thanks for sharing such a simple way to make a big impact! Very nice, Kim. I like that you didn’t have to sew because I can’t sew!! Love the Target dishcloths, too. I saw those towels at Target and loved them! What a clever idea to make them into a valance. It looks great! Kim, I LOVE IT! And, wow, as a dish towel freak, I can’t understand how I missed these at Target! I love love love these dishtowels. I thought they MIGHT be on sale this week since the other stuff is at Target but alas…. I’m swooming over what you’ve done with them. LOVE IT! In my last home, where I had four side by side windows over my sink and counter,I bought Country French cotton napkins at Target and hung them in a V over a wrought iron rod for a valence and had white cotton cafe curtains (that could easily be opened and closed) on the botton iron rod. I got more compliments on those simple window treatment.Tarjay to the rescue again! Your valance is adorable and “sew” easy..love how your powder room turned out. What a great idea! Don’t you just love target!! The dish towels are great and make a beautiful valance. The rest of your bathroom is also beautiful. Happy weekend! What a great idea! I would have never thought about it! So clever and chic. Your bathroom looks great. I really love the framed fabric (or print?)too. It’s really striking. I just stumbled on your blog via A2D’s Link Party. I’ll be following for sure. Looks great with the wall color! I cut and hemmed a Target tablecloth for a valance in an old home…love using fabrics in inventive ways. First time visiting. I love your header! Thanks so much for the comment on my ruffle pillow. Wow, I love the valance! What a fantastic idea! Way to jump out of the box girl! It works so beautiful with the rest of the decor! The Target towels are the perfect LIFT for your bathroom! Brilliant, my friend! What a lovely room! I have done the same thing using napkins folded diagonally, giving the valance a pointy bottom. Think a trip to Target might be in order this weekend. Great job! I am just stopping by to let you know that I’ll be featuring you tomorrow during STICKER time! I hope tp see you there! I really love it! Can’t believe how easy that was! Your bathroom looks beautiful! I bought those same towels a couple of weeks ago.I came home and hung a black valance and then layered those towels over the valance in my kitchen. The kids and husband thought I had totally lost it! So I freaked when I saw your post. (After a little while of looking at them, the rest of the family loves them now, but they weren’t sure at first!) I totally loved them from the beginning! Love yours too! they look really crisp and chic! love it! I love the colors and the idea. If you ever get tired of it, I have a place waiting in my kitchen for it! Not only is it a great idea, but you’ve made them deeper by hanging the rod higher. I don’t like the skimpy little valances I’m seeing everywhere. Looks great. I love how simple this is while still delivering great impact. Love the rest of the bathroom too! I bought four of the same towels at my Target. I was thinking of using them as chair back covers. Love the idea! I never thought to turn dish towels into a valance! What a brilliant idea! I think I’m going to do this in my master bathroom! Kim, thanks for your fast reply. I am new to your blog and really amazed at all your DIYs. I also love bright room with natural light. Will try the blond on the bedroom facing northwest. that you will definitely get good knowledge. access visitors. Pleasant work, keep it up. Those are yours alright! . We at least need to get these people stealing images to start blogging! pages, but I recommend you to use Google’s free blogging services. so it’s nice to read this website, and I used to go to see this blog daily. usually do! I take pleasure in reading a post that may make folks think. This paragraph is related to web programming is in fact good in favor of me as I am web developer. Of course, what a great site and informative posts, I will add backlink – bookmark this site? best site to get one. For instance, you set 10 percent of the money down, the dog owner carries back a 10 % second mortgage, and you get an 80-percent first mortgage coming from a conventional lender payday loans no credit check put yet another way, you lose the protection of those entities in case you personally guarantee financing. of msn. Τhat is а reallу well written аrtiсlе. Ι’ll be sure to bookmark it and return to learn more of your helpful info. Thank you for the post. I’ll ԁefinitely cοmeback. This post is invaluable. When can I fіnd out moге?